Please Choose Size 5" 5 ¼" 5 ½" 5 ¾" 5 ⅞" 6" 6 ¼"
The NS Pacifier Weymouth is a revolutionary new concept in Weymouth design! 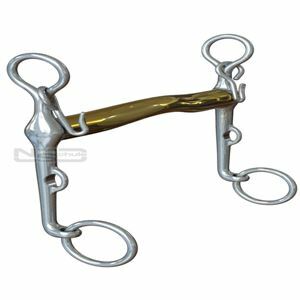 This Neue Shule weymouth has been designed especially for the horse with a short smile (small distance from the corner of the lip to the muzzle). Does your horse draw the tongue back creating tension through the jaw, poll and neck? When the curb rein is employed ideally the Weymouth cheeks should rotate back at approximately 45°. The curb chain is engaged at this point restricting further rotation and simultaneously the mouthpiece rotates forwards and comes to rest vertically within the mouth. It does not roll forwards onto the tongue. A mild ergonomically designed Weymouth. The gently sloping mouthpiece forms a wide, low tongue bridge designed for maximum comfort across the tongue and gentle, even weight distribution over the bars. The mouthpiece is a constant 16mm diameter, circular over the bars and cleverly changing shape forming an oval profile over the tongue, thereby occupying minimum volume between the tongue and upper palate. A very kind, gentle mouthpiece designed specifically for maximum comfort and clear communication. It is beneficial for horses that have a ‘short smile’ (small distance from the corner of the lip to the muzzle), as it will sit further back in the mouth. This leaves more room for the bridoon (snaffle part of the double). The comfort factor will discourage over-activity and tongue evasions and it is also physically harder for the horse to draw the tongue back and get it over the mouthpiece as there is usually insufficient room to achieve this. This revolutionary design has eradicated many long term tongue evasions, and often horses that were previously considered un-bittable in doubles are now happy and going extremely well.